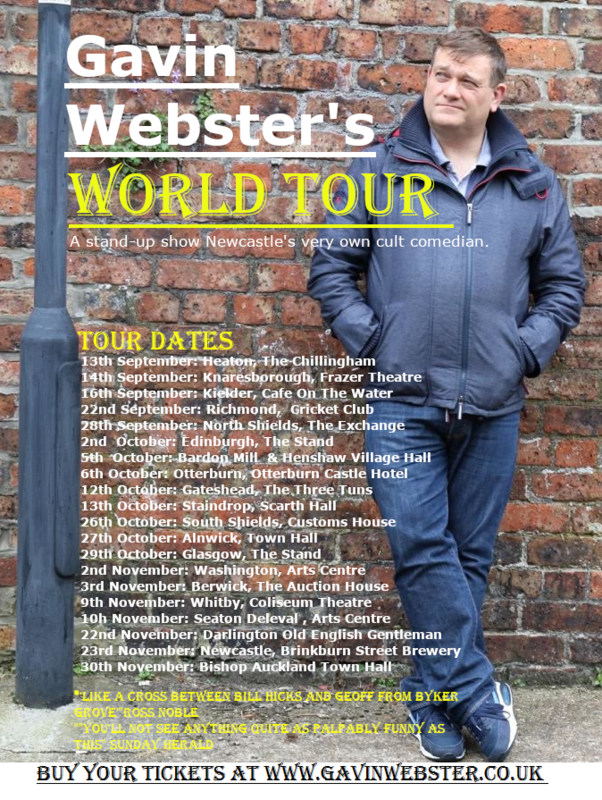 Cult Geordie comedian of over 25 years Gavin Webster is finally doing a tour, a World tour to be exact. A massive influence on the stand-up scene on Tyneside he’s decided to bring his guitar, ukulele, book of poetry and his barrow load of quick fire jokes and surreal routines along with his furious rants and throw them at audiences round the World. Well the world being North Yorkshire, Lowland Scotland, County Durham, Northumberland and Tyne and Wear but it’s still a World Tour in name. From the bloke who brought you Edinburgh shows called ‘The Sexist’s Sexist’, ‘Bill Hicks Wasn’t Very Good’, ‘Don’t Give Any Money To Comic Relief’ and the infamous ‘All Young People Are C**ts’ and someone who has a forthcoming online sitcom coming out at the beginning of next year called ‘I’ve Got A Job For You Gav’ you’d be mad to miss an hour of a Geordie stand up legend with full support. Come along for this evening of fantastic comedy. This is a bespoke local tour in intimate venues. This will be a hilarious and unmissable comedy experience. Show will include a support act. Due to the nature of the tour, Gav will be playing smaller rooms, meaning that these events are likely to sell out! So buy your tickets before they do!